#4 in the 40 for 40 gives us what are probably the definitive versions of these iconic characters on film; a movie that absolutely redefined the so-called ‘comic book movie’. With the greatest (and most tragic) performance of a young actor’s short career, helmed by an A-list director and loved the world over, this film is nothing short of a tour de force. #4. The Dark Knight (2008) Christian Bale, Heath Ledger, Michael Caine, Maggie Gyellhaal, Aaron Eckhart, Gary Oldman, Morgan Freeman. Directed by Christopher Nolan. Batman is my favourite superhero, my favourite comic book character, heck… possibly even my favourite fictional character period. So the greatest Batman film of them all was always going to rank highly on a list of my favourite all-time movies. And I stress… favourite movies. Because, are there better all-round quality films than The Dark Knight? Of course. But for this list of personal treasures, I stand by my decision to place this near-masterpiece at #4. I’m not going to bury the lead. One of the major factors in The Dark Knight becoming the Godfather of superhero movies is obviously due to the performance of the late Heath Ledger. As Batman’s greatest nemesis, The Joker, Ledger transcended any role he’d ever played before. He is unrecognisable on-screen. His make-up-smeared face, his mannerisms, his voice, none of them belong to the actor we knew before this movie was released, and Ledger’s ability to transform himself is perhaps the only legit example I can think of where I absolutely cannot see the actor playing the role. From the opening bank robbery prologue, in which it almost seems as though the Joker has just ‘popped’ into existence seconds before, Ledger captivates the audience. Covered by a literal clown mask for most of these scenes, the first reveal of his grinning face is an unnerving tease of what’s to come. Unlike many fanboys, I have no issue with a Joker who wears make-up (instead of having permanently-bleached-white skin). This simpler approach to the Joker’s iconic look works a lot better in the grounded version of Batman’s universe that director, Christopher Nolan has created. Having the make-up be so messy, so dirty, and clearly having been reapplied himself without having removed the previous coat, cracks and warps the Joker’s face into the perfect visage of a scary clown. Even his blackened eyes force us to focus on the intensity pouring out at us from within. His classic-green Joker hair remains, although for Ledger’s version, it appears to be the possible result of a bad, blonde dye-job, and personally, I enjoy how there’s make-up residue stained all over his hands and clothes. It’s another brilliant little touch Ledger adds to an adaptation of the character that is nothing short of a true anarchist. 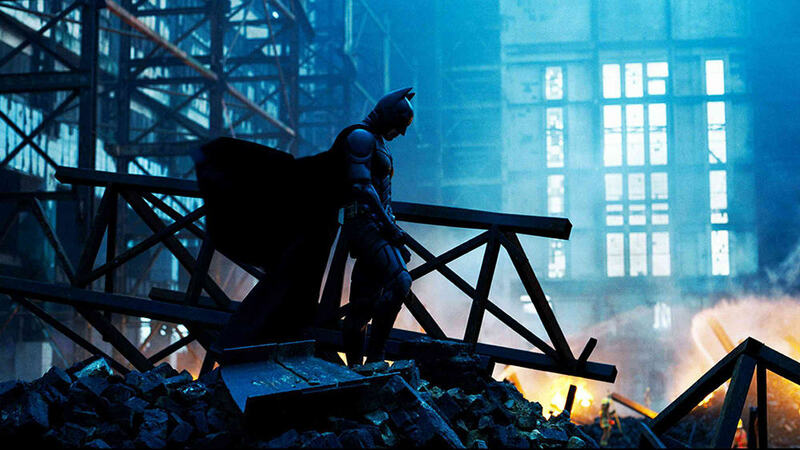 The story of The Dark Knight picks up flawlessly after its predecessor, Batman Begins, where the mob has been left scattered and confused by the emergence of Batman. This early plot-line is perfect for the real introduction of the Joker, as Ledger saunters into to a mob ‘group-therapy-session’ with a wonderfully-evil take on the expected Joker laugh. As incredible as Ledger’s performance is, a lot of the credit must still be given to the aforementioned Christopher Nolan. His ‘realistic’ version of the once-flamboyant and fantastical world of the ‘Caped Crusader’ allows Ledger the canvas with which he crafts his maniacal villain. While it’s evident by watching Batman Begins that Nolan was inspired by Blade Runner, this time around, the director seems to channelling Heat, creating an equally-as-gripping crime drama that just-so-happens to include characters that dress up as clowns and bats. Nolan’s use of blue filters helps bring a dreary tone to Gotham, and his use of IMAX cameras (way back in 2008) and real-life locations opens up the scope of the movie more than the previous, sound-stage-based Bat-films from Tim Burton and Joel Schumacher. Together, Nolan and Ledger helped bring us one of the greatest blockbusters of all time, but make no mistake, The Dark Knight still owes a lot to the man under the cowl: Christian Bale. Nolan allows Bale to remain faithful to the source material in this movie. We see just how accomplished Batman has become in the year that’s passed when he takes down a returning Scarecrow (Cillian Murphy) and his drug deal with the Chechen (Ritchie Coster). As a side note, it’s nice to see a returning villain in a Batman movie for once, since the older movies were so quick to move onto the the next member of the Rogues Gallery. Murphy does a great job with his cameo, finally morphing into the all-out Scarecrow comic readers know and love (and fear). True to the early comics, Batman is met with a deal of mistrust by the GCPD and the general public, and Bale plays it perfectly. To me, Batman should always be a polarising figure to the citizens around him, and Bale manages to take what he did in Batman Begins, and parlay that into a definitive performance. The bank vault meeting with police ally and soon-to-be Commissioner Gordon (Gary Oldman) really cemented Bale as Batman for me. Bale emits that classic Batman standoffishness in this scene, perfectly-stoic and saying only what he needs to, before vanishing without a trace. Okay, let’s address the gravelly elephant in the room. The voice. Look, I don’t love it. But I don’t hate it. It certainly isn’t the all-out joke it’s been made out to be in recent years, and for me, in The Dark Knight at least, there’s only one scene where it fails. I’ll let you figure out which one. Bale also lets us understand the toll undertaken by being Batman. Seeing his scars, cuts and fresh bruises allow us to understand just how hard being a vigilante is on Bruce and why this version of the character isn’t looking to do this forever. Early scenes set up the conflict Bruce has of refusing to allow Batman to have limits, while also pining for childhood friend, Rachel (Maggie Gyllenhaal). I much preferred Gyllenhaal as Rachel over Katie Holmes. Don’t get me wrong, I don’t think Holmes was bad in Batman Begins, but in a film with such a stellar cast, she really did stick out as the weak link. Maggie Gyllanhaal gives more credibility to the role. She seems more capable of being an assistant D.A. and she’s excellent at showing us how she’s torn between Bruce and the other star of the movie, Harvey Dent (Aaron Eckhart). At the time, I questioned Eckhart’s casting, wondering if using an unknown actor (unknown to me, at least) to portray such a well-known Batman character would work. But luckily, I was wrong. Eckhart is terrific as Harvey Dent, delivering a great, old-school leading man performance reminiscent of an actor like Robert Redford, who would have also made a wonderful Harvey Dent back in his day. Of course, comic fans (and even most movie fans) knew going into the movie what Harvey Dent’s fate was destined to be. It was just a matter of whether or not he’d become the villainous Two-Face in this movie, and how well his turn would be carried out. Thankfully, both were handled superbly. Yes, Dent succumbs to the darker aspects of his psyche and becomes Two-Face by the end of the film, but unlike a movie like Revenge of the Sith, this hero’s fall is expertly done. He goes from Gotham’s white knight to deranged maniac in the span of two hours, but thanks to the script and Eckhart’s performance, the turn is totally believable. Again staying true to the source material, Nolan keeps most of Two-Face’s traditional origins alive in The Dark Knight, while at the same time, adding his own touches here and there. The famous two-sided coin, the heart of Two-Face’s psychotic decision-making process, is introduced early on, and in a nice, original piece of writing, having it burnt on one side due to the explosion that kills Rachel is a new spin on a classic comic book Two-Face trope. As is using a flammable liquid to burn off one side of his face, instead of the customary acid from the comics. Obviously, the death of Rachel is a major turning point for Dent becoming Two Face. Not only the physical scarring but the emotional and psychological damage that’s inflicted by knowing Rachel is gone, a victim of his obsession with stopping Joker and the mob, headed by yet another classic Batman rogue, Salvatore Maroni (Eric Roberts). It is just one more ingredient that topples Harvey’s sanity and leads us to the horrifying reveal that Two-Face has taken over, brought to life with some of the best make-up / CGI effects I’ve ever seen. Before seeing the film, I wondered if we would even see Two-Face, but when we did, I couldn’t have been happier with his overall aesthetic. He’s perfect. Yes, Harvey Dent turns to evil in this movie, but his earlier scene on the rooftop with Batman and Gordon is still a highlight for me. Ripped straight from my favourite Batman comic of all time, The Long Halloween, this moment of superhero movie magic is what die-hard Bat-fans like me had always wanted to see. The scene is perfect. I love how Gordon and Dent continue their subtle debate about their different approaches to law enforcement, arguing the best way to take down the mob. And Batman just stands there and assesses the situation, topped off by that amazing spiral camera move. Speaking of Gordon, Oldman is brilliant in the role. Especially later in the movie, when the stress of it all finally gets to him. His delivery of, “We have to save Dent… I have to save Dent!” is such a great character moment, performed to perfection, that I always rewind and re-watch that line at least twice. Like Gordon, the other members of Batman’s supporting family are again wonderful in The Dark Knight. Morgan Freeman shines once more as Lucius Fox, dealing with new tech for Batman, business deals for Bruce Wayne, and blackmail attempts by the snivelling Mr. Reese (Joshua Harto). Michael Caine also brings another powerful performance to the screen as Alfred. Thanks to the gravitas Caine offers, when Batman isn’t prepared for a threat like Joker, we can see how strangely enough… Alfred is. His story about the bandit in Burma not only teases the Joker’s future actions but also gives us a little insight into Alfred’s possibly-sordid past, all the while, offering loving and fatherly advice to our brooding hero. The music of The Dark Knight also helps it stand out of the superhero movie crowd. Hans Zimmer creates a series of faultless musical cues, from the Joker’s unnerving theme, comprised of a solitary note, quivering on the edge of sanity, to the garish and almost violent drums that interrupt the score like Batman pounding criminals in the face. I especially like the new ‘finished’ Batman theme from Zimmer this time around. In Batman Begins, Batman’s theme was minimal – because Batman, himself was a rookie, an incomplete hero. But in this second film, his rousing crescendo really evokes a hero rising to the call. All superhero movies require set pieces to capture the audience’s attention and further the plot. Well, in this film, they’re some of the most audacious action scenes ever shot for a movie about a man dressed up like a bat. The Hong Kong scenes, in which Batman retrieves mob ‘math-man’, Lau (Chin Han) is something we’ve never seen before in a Batman movie, and the police convoy / chase through the streets of Gotham (complete with the death of the Tumbler and birth of the Bat-Pod) ramps up the tension to white knuckle levels of excitement. What starts out as a straight forward chase under the streets (to protect Harvey Dent) soon moves into a gasp-out-loud moment when Batman manages to flip the Joker’s stolen semi-trailer. And then we are treated to a heart-stopping showdown between Batman and the Joker with the ‘hit me’ scene. This is a great character moment for Batman when he refuses to run down and kill the Joker, despite knowing the resulting crash may end with his own death. And like all great heroic moments, just when it seems Batman is done for – the previously-thought-dead Gordon returns and takes the clown into custody. It’s a brilliant moment for a long-term Batman fan like me to see that Nolan has included Batman’s tactical nature in this movie. Just like in the comics, his back-up plans have back-up plans, and this one is pulled off to perfection. I will just briefly touch on Joker’s jail cell scenes, since it seems a lot of movies since followed the ‘villain wanted to be caught’ motif after the success of this film. Star Trek Into Darkness, Skyfall and yes, MCU purists, The Avengers all used this same plot device. However, it is at its very best in The Dark Knight. Principally because Joker’s temporary incarceration gives us what is undoubtedly the best moments in the film – the interrogation scene. Ledger effortless shifts from cold, soft-spoken weirdo in his conversation with Gordon, to all out maniacal supervillain once confronted by Batman. Joker’s motives, his mantra, his very philosophical outlook on life is spelled out in this scene. As is Batman’s powerlessness once it’s revealed that both Dent and Rachel have been abducted. Watching Batman just wallop the Joker straight in the face, only to have the clown prince of crime cackle back at him, is chilling. As a master of fear, in this scene it’s such a constant to see Batman afraid, as he realises he has zero power over the Joker. Yes, this Joker really is an agent of chaos, epitomised by the excellent meeting of Joker and Harvey in the hospital. When Joker outlines his personal philosophy to Dent, offers his life up to fate and the flip of the coin, while explaining that chaos (among all its horror) … is fair… that’s when Two-Face is truly born. Dent’s rampage against those who wronged him is also consistent with The Long Halloween. But this Two-Face has no delusions of grandeur. Nolan stifles the notion that Two-Face simply becomes another mob boss, replacing those he killed – which personally I think is a great decision for this film. Instead, Two-Face is on a suicide mission. He knows he’s going to die (as you would in this realistic world where infection would get to untreated wounds like Dent’s in a matter of days) but he wants to ‘judge’ and ‘punish’ both Batman and Gordon first. The fact that that the climax of the film isn’t a big action set piece or a CGI-fest or even a knock-down-drag-out fight, really works. 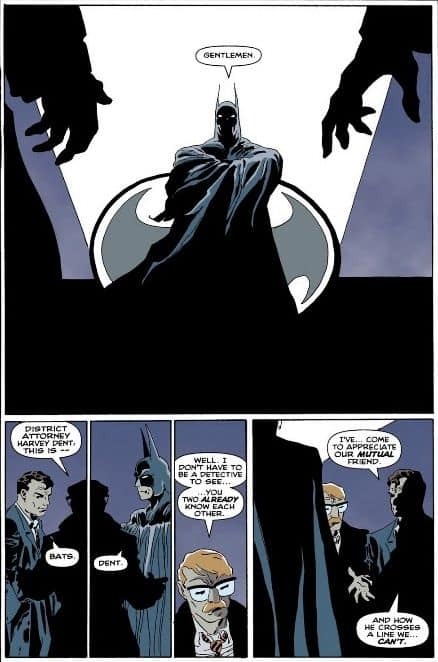 It’s a sombre, personal scene in which the philosophies of the characters we saw team up earlier (Batman, Gordon and Dent) face off one last time. In true Batman style though, he saves the day but leaves us with a sense of ambiguity. Batman is certainly responsible for Two-Face’s death, but does that mean he killed him? Did he break his one rule? It’s really up to the individual viewer to decide, yet another decision I applaud Nolan for making. The dark (no pun intended) ending fits Batman to a tee. As I said before, Batman should always be a polarising figure, and having him framed for Dent’s crimes as the only way to philosophically defeat the Joker is a masterstroke by Nolan. It’s been said a million times before, but it truly is one of Hollywood’s greatest tragedies that Ledger didn’t live to see the magic of this film and the joy his performance brought people. Especially when I remember I’m doing this list leading up to my 40th, a birthday Ledger would also be celebrating this year had he not passed away. But thankfully, we are able to watch Ledger’s (and Bale’s, and Caine’s, and Oldman’s, and Gyllenhaal’s, and Freeman’s, and Eckhart’s) wonderful turn in this movie, and smile each time as though we ourselves were once subjected to… wait, we never did learn how he got those scars, did we? Oh well. We can’t have everything, I guess. But that’s okay. Smile. Rating: 5 out of 5 double-sided coins. Favourite Moment: The interrogation scene. Honourable Mention: The Pencil Trick. Make sure you grab an Unfunny Nerd Tangent shirt! No need to flip a coin on this one, since Mon Milfma isn’t just the hero you need, she’s the one you deserve!